Fire is now home with Alfred, Rosemary, and Daisy (not pictured) in Cincinnati. Fire was returned by no fault of her own and was eagerly seeking a family to love her forever. 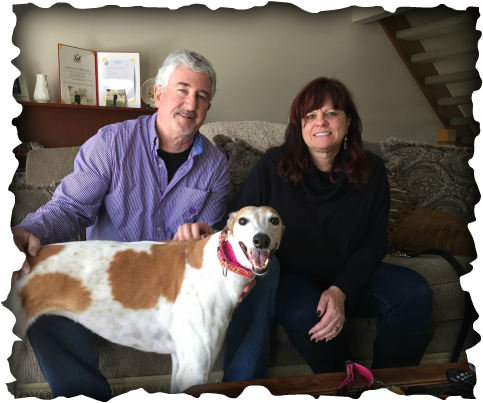 Alfred is an experienced greyhound owner and was ready to have another. This will be Rosemary's first greyhound but Fire was already in her lap and showing her how loving greys are within the first 15 minutes! This family is the perfect home for this girl and Fire will definitely be seen out at our events!